High performance extra plate kit for 1990-97 Big-Twin & 1991 to present Sportster (XL). 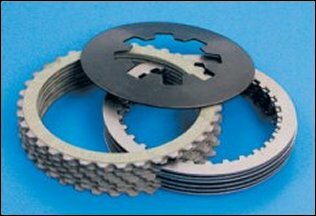 Includes 8 aramid fibers friction plates on tempered steel cores. Starburst groove pattern for maximum heat dissipation & oil circulation. Included are 6 tempered steel drive plates. Preset stack height for easy installation. 15% more clutch area for high performance strokers. Includes 15% stronger diaphragm spring. Frictions and steels- This one you re-use the double riveted steel plate so all frictions, steels and double riveted steel plate 1.275 - 1.290"